Have you ever imagined an Indian Sherlock Holmes? Well here it is in the form of ‘Shrilok Homeless’ by Pika Nani. Shrilok is exactly like Sherlock but there are a few variations in his habits that are suited more to the Indian style. If you look at the cover page closely you will see some recognizable buildings in the background. I you look even closer you will notice that the book is set in Mumbai. Shrilok uses his skills of logic, observation and deduction to solve ten cases and the last one is with his enemy Masterji (a tailor). I am going to review the very same book. First of all, you must be very curious to know how Pika Nani turned Sherlock into Shrilok. Well first let us review the facts we know about Sherlock. He likes to blow on his pipe while thinking. The only person to have outwitted him is a woman named Irene Adler. His enemy is a professor named James Moriarty. The inspector in the Sherlock Holmes books is Inspector Lestrade. Sherlock is a private detective. He has a companion named Rohan Doctor who studies in class VII. He likes to drink chai while thinking. The only person to have outwitted him is an 8- year old girl named Pari. His enemy is a tailor named Masterji. 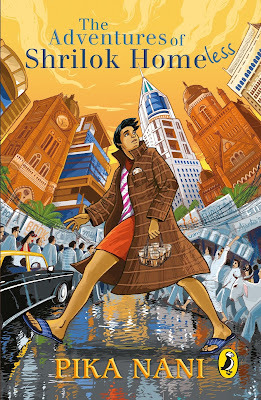 The inspector in this book is Inspector Divya Lokhande. Now you have seen that the author has cleverly twisted everything into an Indian manner. 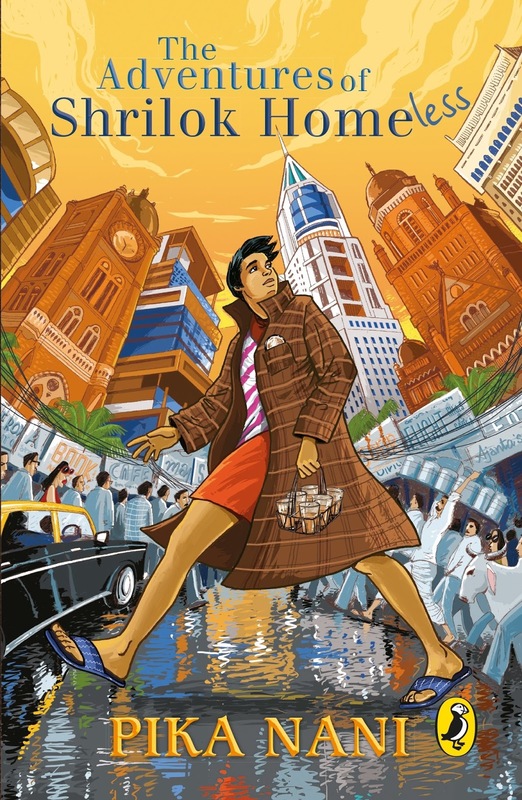 As the book is set in Mumbai few things are also related to ordinary Mumbai life. Few of the cases such as the ‘The Lunchbox’ and the ‘The Rose Diamond’ are related to Mumbai things. ‘The Lunchbox’ is related to a dabba and dabbawallas. ‘The Rose Diamond’ all starts with a simple vada pav. This gives the Indian touch needed. All the cases are quite interesting and funny. I like the book very much. My favourite case was ‘The Rose Diamond’. I found this case very interesting. The mystery really needed you to think to find the answer. My favourite part in the mystery was the part when they start interrogating the workers at the shop from where the diamond was stolen. I enjoyed the book as it was simple yet really interesting and fun to read. You feel like you are solving the mystery along with Shrilok when you read the book. I liked the book but my sister did not. She found it boring. Few people might not like it but they are free to have their own opinions. All the ten cases are amazing. Each one better than the other. I loved reading this book and had a really good experience. Read “Shrilok Homeless” By Pika Nani to find out more about Shrilok and his interesting adventures. Explanation: You had to cross out every alternate letter to find the answer. It was quite simple. Explanation: After each word related to temperature or weather you had to underline the next one. Answer was The Lunch Box.